Jungle Safari Wild Plush Stuffed Animal Elephant - Curtain Critters Inc. 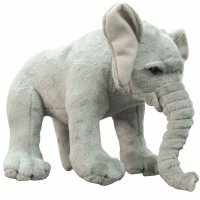 This absolutely adorable, soft, detailed, realistic, 10" Elephant is right at home in any jungle, safari, zoo, or Noah's Ark themed room! You can't help but smile whenever you see him. Children will love to snuggle, hug and play with this soft plush taking him everywhere they go. They're sure to be any child's new best friend and bring smiles to children of all ages! YOU WILL RECEIVE: - One 10" (25.4cm) ELEPHANT with all tags, in a sealed clear polybag AGES: For children 3 and up INTERNATIONAL CUSTOMERS: Please allow 7-10 business days for processing and 4-6 weeks for international delivery. Regular shipping charges apply. All international items are shipped via USPS 1st Class International Mail with delivery confirmation. We also offer USPS Priority Mail International for faster delivery and "extra" tracking along the way. Just select "USPS Priority Mail International" in the shipping options when your order. Please note: Priority Mail shipping is not necessary. It is only an additional shipping option we like to offer to our international customers. However, we do recommend Priority Mail Shipping when shipping to South America.